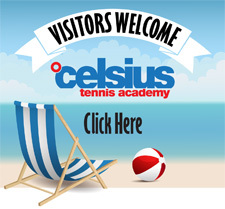 How Big is Celsius Tennis Academy? How much does it cost to attend Celsius? Answer: The cost per athlete is determined by the players level and how many times per week their schedule and level of committment allows them to come. We have options for players from two to five days per week and day and after school programs. Do you offer school and lodging options? Do I need to be a member of the club for my child to attend Celsius? Answer: No, membership is not required. You may stay on the grounds while your child plays if you are not a member, but you are not premitted to use the athletic facilities. The club, however, is very reasonable priced and one of the benefits that make us stand out. It’s a great opportunity for you to get a workout at the same time your child plays. Membership starts at just $45 per month for fitness and $125 for tennis. Full family memberships are also available at very reasonable rates. Answer: That depends when the weather arrives. If rain comes immediatly before scheduled practice or has started after it begins, then play will usually move indoors and we will work on strokes and fitness inside our large facility. Should it be raining all day with no end in site play will be suspended. Note: the 10 & Under program will always move indoors without any interruption to play. What about junior tennis tournaments? Answer: Most of our advanced intermediate and competitive 90 and 180 program athletes participate in tournaments regularly. We are fortunate in Florida to have a wide variety of choices most every weekend for players of all levels. You coaches at Celsius will help you work out a tournament schedule that will make the most of your play at the academy. Registration, transportation is up to the individual athlete as the choices every weekend are numerous. Once per month, Celsius usually travels to an out of town tournament as a group. Should parents not attend attitional fees apply to cover expenses and weekend coaching.